It has been a little under two years since the members of the Major Economies Forum, under the auspices of the White House and the direction of Todd Stern, divided up priority areas for research and development in everything concerning energy. Common sense suggests that investment in energy R&D should not be duplicated from one country to another, while resources should be maximized by topic, ensuring that growth areas not be overlooked. Each of the members of this informal organization, all but a carbon copy of the G20, was allotted its areas for R&D. France’s portfolio included wave energy produced on marine areas. At first this topic looked like a consolation prize. Whatever the governments think about it, the private sector is raging over the marine challenges. This new market is already subject to stiff competition, as usual. And that’s a sign of good health for wave energy. In the United States, Ocean Power Technologies is among the leading pioneers in wave-energy technology that harnesses ocean wave resources to generate reliable, clean and environmentally-beneficial electricity. 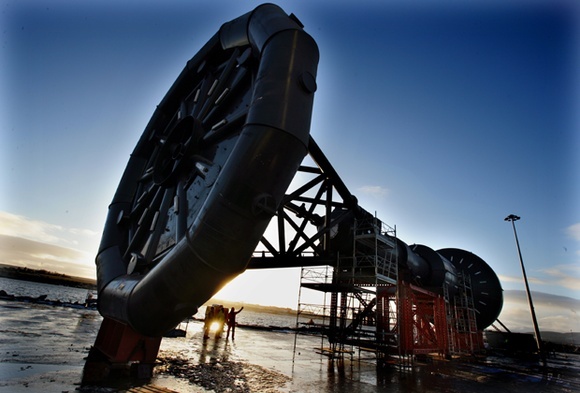 The Company has a strong track record in the advancement of wave energy. OPT’s proprietary PowerBuoy system is based on modular, ocean-going buoys that capture and convert predictable wave energy into clean electricity. The Company is widely recognized as a leading developer of on-grid and autonomous wave-energy generation systems, benefiting from over a decade of in-ocean experience. The company, head quartered in New Jersey, listed on the Nasdaq stock market is confident about its future and that of the industry. Charles F. Dunleavy, Chief Executive Office of the Company, is particularly grateful for the US Department of Energy’s continued financial support: “These awards are significant steps in a global drive to make wave power a commercial reality. OPT’s programs of work under these awards are in accord with the Department of Energy’s objectives to help develop innovative technologies that contribute to the clean energy economy”. The US Secretary of Energy, Steven Chu is keen to accelerate the technological and commercial readiness of emerging marine and hydrokinetic technologies, which seek to generate renewable electricity from the nation’s oceans and free-flowing rivers and streams. OPT has two types of PowerBuoy product: autonomous devices that provide persistent, off-grid energy in remote ocean locations for a wide variety of applications; and utility devices, designed to generate power to be fed to the national electricity grid and to be deployed in arrays to form a wave farm. OPT is currently testing its 150kW buoy and is in the process of developing its next generation utility device that will have an output of 500kW. Performance in energy conversion efficiency of each entity should continue to improve, while maintenance costs decrease. OPT is looking for turnkey projects.